Need a recap on the whole “project 52” thing? Go here. This week over at /r/picturechallenge, we had arrived at a slightly more traditional challenge topic for the week: ‘landscape’. That’s not to say that it’s any more limiting, and sometimes the most superficially basic themes present the biggest challenges as far as picking a specific shot, and the greatest opportunity for creativity in fulfilling them. For anyone reading this from anywhere in the same general vicinity as the Ottawa Valley, you’ll know that we’ve had one of the coldest winters in recent memory this year. 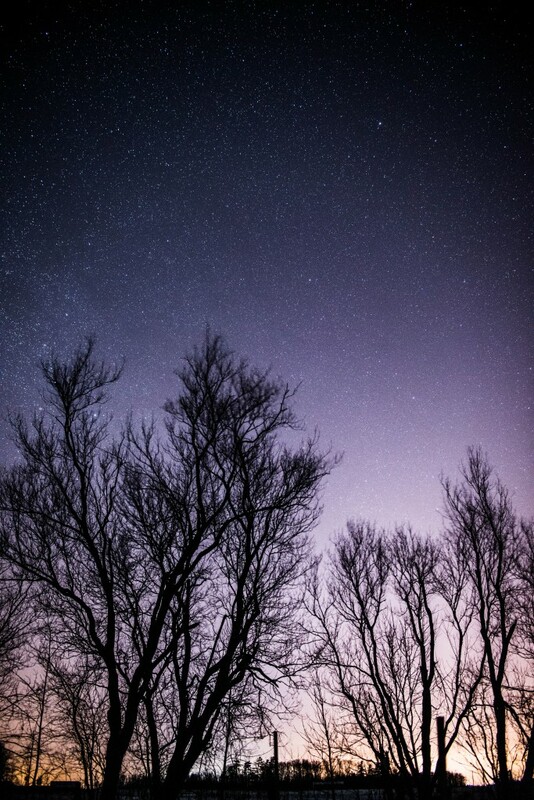 This brings us to one of the more inconvenient truths of outdoor photography: the colder it is, the clearer the night. 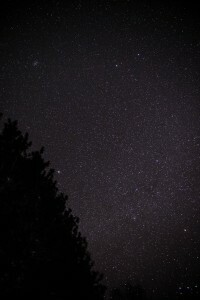 This means that if you’re looking to get great shots of the stars, which are quite spectacular out in the country up here) you need to face the fact that it’ll likely mean standing around in the snow bracing against temperatures approaching the mid minus-30s. Astrophotography is tricky, at least for me, and at least when I’m standing around in arctic temperatures trying to still use my hands, but getting the right balance of ISO, shutter speed and aperture to let enough starlight in without capturing their movement (as I’ve still done a little bit in these shots) pays off in the end. The key is to let as much light in as quickly as possible without resorting to a really slow shutter speed. The stars actually zip around pretty quick, all things considered, which is why if you click through on these photos and zoom in to maximum resolution, you’ll see the streaks caused by their motion, even just shooting at 15 seconds. Normally, really low light calls for really slow shutter speeds, and if star trails are your aim, then that’s absolutely true. Crank that up to bulb, get a locking shutter release and then go watch a movie for the 2-3 hour shutter time. For stuff like this, though, the goal is more to have the stars as frozen as possible. If your camera can handle really high ISO levels without introducing too much noise, then that’ll give you more flexibility to work with. Basically, get the ISO as high as possible, shoot with as wide open a lens as you can (more on this shortly) and try to keep the shutter speed down to around 10 seconds. If you have to go up to 15, though, it’ll still work passably enough, as you can see. The (other) tricky part with this is getting the focus right. If you’ve got the focal ring cranked all the way to infinity, you may notice (as I did) that the stars themselves are just a little too blurry for their own good. There are two things that I did to combat this situation. The first was to pull the focus back just a little bit (my 1.8 lens doesn’t have an actual focal ring display, so I just ballparked it until I got a result I liked) and drop the aperture down one or two stops to give you a little more depth of field to work with. By changing the focus and stopping down the aperture, I was able to sharpen up the stars. If I’d sped up the shutter a bit, it would have helped even more. Ah well – next time. Like so many things with photography, trial and error is one of your best friends in this case – especially because just looking through the viewfinder will give you no indication whatsoever what you’ll end up with – you have to wait until you actually take the photo to see what you need to adjust. So bring some coffee/tee/Bovril with you, bundle up and prepare for a lengthy stay in the great outdoors. On a more philosophical note, I both like and regret this image. On the one hand, I think it looks neat. On the other hand, it’s a pretty stark and undeniable example of the passive difference that humans make to the planet. It’s obviously not that we shouldn’t have lights, but it’s more just an observation on the profundity of our own impact. No soapbox, just interested observation.